5 Market Place, Kirkbymoorside became our new home in September 2016. Since then we have been beavering away behind the scenes with plans for a complete exterior renovation. All the guttering and the render will be removed and replaced. In addition we will be altering the colour scheme from White with Black detailing to an yellow off-white with dark navy blue highlights. We hope that this will position the building in a favourable light in the town and protect it for many years to come. 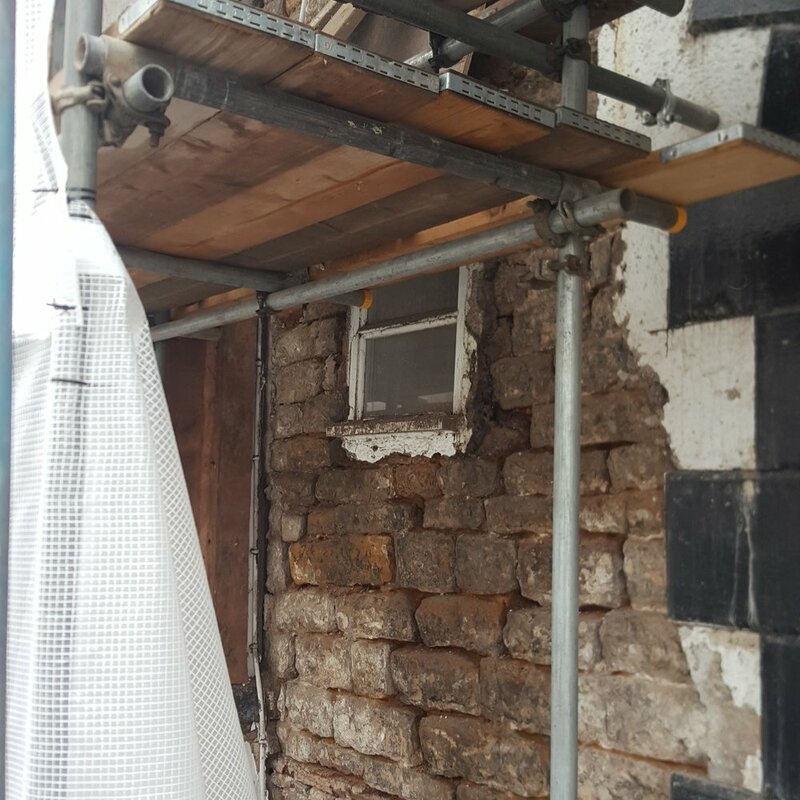 We have worked hard with the landlord, Listed Buildings and our contractor, Sid Brackley to minimise the impact of such a large renovation job. We anticipate that work will be on going for several weeks from the 19th June 2017. Periodically we will need to close the gallery to both protect the workforce, visitors to the gallery and the works of art held in the gallery. We ask for your patience during this work. Should you have any questions please do pop in and see, either Kate or Nick for a chat about the scheme and how it may impact the local community. That’s a wrap! Well the external decoration is just being finished off. Inside is all done now with new lighting and new displays installed. We have several new artists and many of the existing exhibitor have sent new works up for the reopening at the beginning of September 2017. The panorama from the top level of scaffolding. A not much seen viewpoint of Kirkbymoorside Market Place. Not much to see here, shrouding goes up to protect passers by from any debris. No workers today, must be too hot in Kirkbymoorside! Rapid work this morning and a lull for lunch. The render is coming off to reveal some stunning limestone and sandstone for the first time in over a hundred years. This creates a dilemma, do we consider apply for Listed Building Consent to keep the stone on show? Oh dear, was the render holding up the buildings as the lintel certainly wasn't! Acrow Props on the way and a rethink on removing the render in one go! How many more horrors will be find? 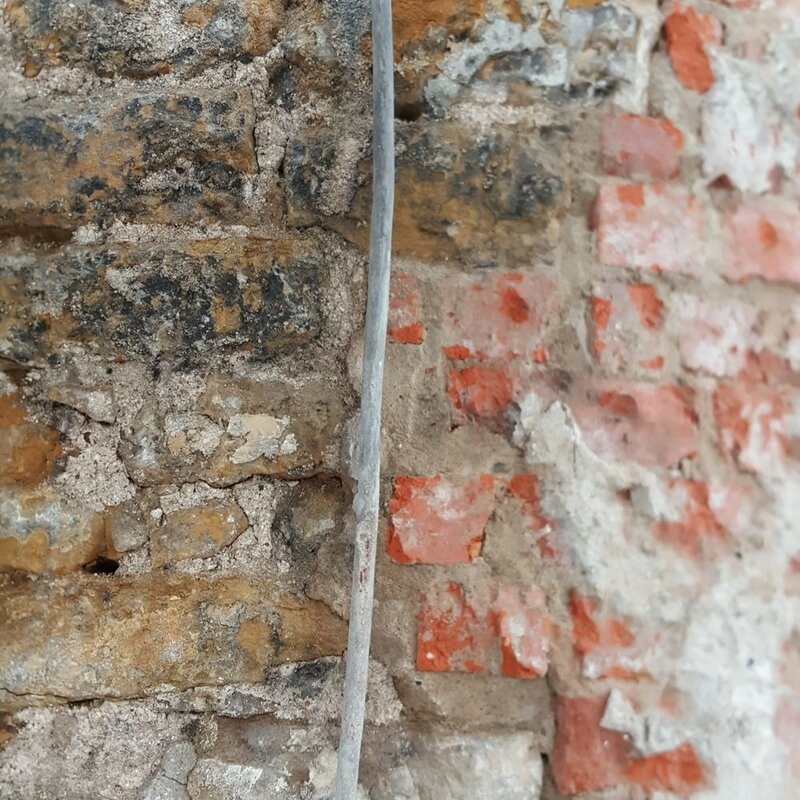 Copper pipe found inside the old render - now is it connected to the mains? Losing the now redundant fan will be one of the benefits of the renovations. Oak lintels have been delivered today to replace the old ones that had disintegrated into dust, such a shame to cover them in render! A great message but I really would rather it was applied with consent and a little more skill! Market Place Takes a Beating! The weather and lack of maintenance over the years has taken it's toll on the Market Place facade. The window is on the point of falling out! That'll be a new window then please. Not much has happened this week due to poor weather! Lots of workers on site today and we are open till 17:00! We had previously thought this cellar was filled in. There's no access from the inside and the old entrance was becoming dangerous. I may just have an explore before it gets walled up! Our friend has covered up the underwhelming graffiti and done a great job. Lots of comments from the locals and a visit from the police! The base coat is being applied this week before a lull whilst the render hardens. During this time we will repair the chimneys and work on the windows. We lost a day to poor weather but the forecast is good so fingers crossed it will be plain sailing to the end now. This week we have identified two more areas in need of renovation with the stone work badly damaged. Yet another job for the cheerful rendering team! 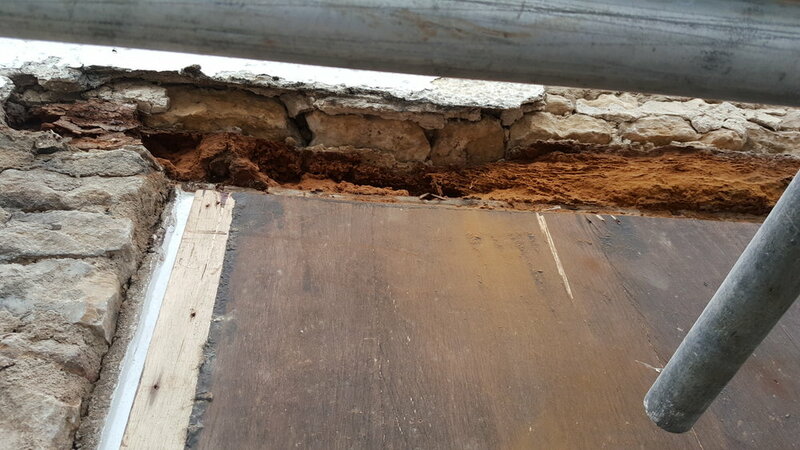 Then we found a very rotten beam that is fairly important in the structure which has to be replaced pretty quickly! Another job and more days to add to the pain! Whilst the gallery is closed for some of the heavy renovation work to be completed we got in our super sparky, Chris, who has worked marvels with a room no one wanted to work on! Super slim-line LED downlights installed and looking fantastic. Weather has played it's part in delaying the build, finally the quoins are in place and new windows being installed where needed. The end is in sight!